Purdue University's fourth annual Purdue Day of Giving April 26 proved to be a whirlwind of a day for the College of Veterinary Medicine. The event is a one-day online fundraising campaign for the university to raise funds for colleges, departmental units, and other campus organizations. The donations poured in throughout the day, and the numbers kept growing until the clock struck midnight. At the end of the day, more than $900,000 was raised for the College of Veterinary Medicine, which earned an eighth place finish on the leaderboard amongst other Purdue units. With such a strong finish, PVM also attained bonus prize money with a boost from an hourly challenge win, amounting to more than $4,000! All of the donations go straight to veterinary programs, as well as scholarships for students and programs providing financial assistance for clients of the Veterinary Teaching Hospital. PVM students, faculty, and staff were encouraged to take part in the Purdue Day of Giving challenges throughout the day. Allyson Morton, administrative assistant in the PVM Office of Advancement, said, "Our Advancement team tries to make the day fun and effective for our students, staff, and faculty, and we enjoy watching everyone having fun with us and engaging in the activities we provide." The team set-up the PVM Purdue Day of Giving headquarters in the main lobby of Lynn Hall along with tables lined with cookies and coffee and a fun photo backdrop with props encouraging social media participation. Allyson, along with PVM Director of Development Tanya Finkbiner, PVM Manager of Development Operations and Donor Relations Cassandra Clore, and PVM Director of Advancement Chad Rohlfs helped rally participation throughout the day. Cassandra commented, "Watching the numbers climb throughout the day was inspiring. When I saw that we, as a university, had surpassed last year's total and we still had five more hours... there really aren't words to express that feeling of awe. I'm so very lucky to work and live in such a philanthropic community." In total, the Purdue Day of Giving raised more than $28 million for Purdue. 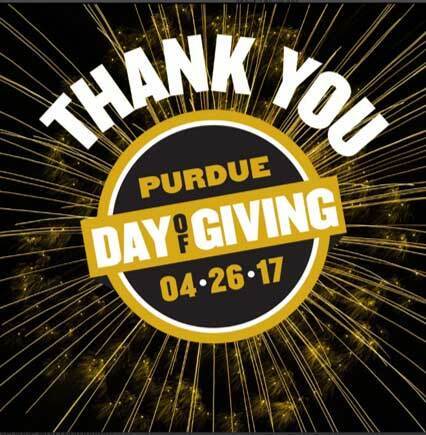 "We are so thankful to our PVM family for the incredible support you have shown for Purdue Day of Giving," Director of Advancement Chad Rohlfs said. "What an amazing day we had as your enthusiasm was truly contagious." 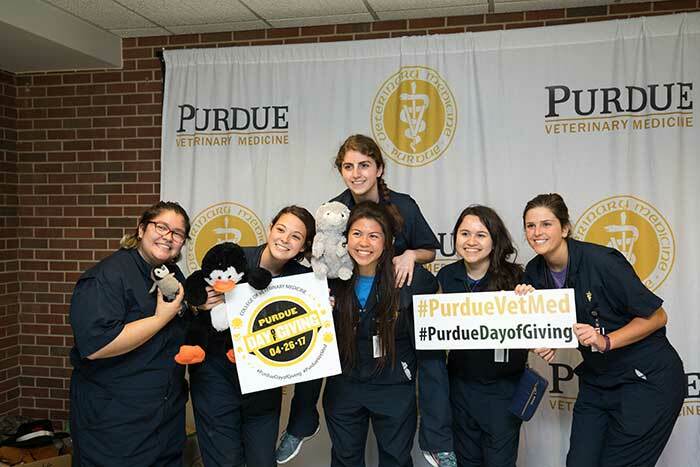 The College of Veterinary Medicine thanks everyone who participated in the 2017 Purdue Day of Giving! PVM students stop by the Purdue Day of Giving photo booth in Lynn Hall for a fun snapshot in support of giving to the College. 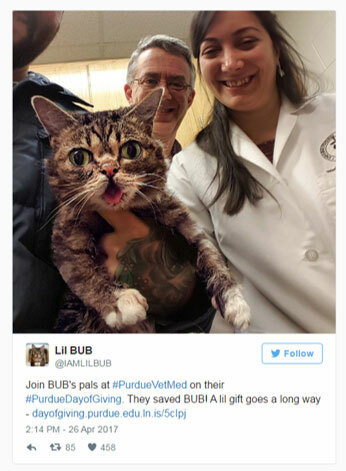 Even Lil BUB popped by on Twitter to show her support during the Purdue Day of Giving April 26.